MONGYAW — Recently, I happened to be in Palaung ethnic villages in Monyaw—a sub-township some 60 miles from the urban areas of Lashio in northern Shan State. At first sight, it was as if the villages were women only, all of them working on farms, tending to cattle and grinding rice in their traditional clothing and silver jewelry. “They are high on drugs at home,” was the answer. On some farms, there was only one man to 10 women, but on most of them, there were no men at all. “Here, men don’t work. They just do drugs at home. Women have to work. They have to work for their husbands,” said Saew who runs a clinic on a volunteer basis in Lwel Soh village. Almost all of the men in all of the 32 Palaung villages in Mongyaw rely on women for their livelihoods, locals said. In rainy season, women grow paddy and corn. In cold season, they grow poppy, which is an ancestral business for them. Ma Un Sa, 40, has spent the past 20 years working on farms and in poppy fields to raise her children. “I had no choice. I had to feed my children. Otherwise, we would have starved,” she said. 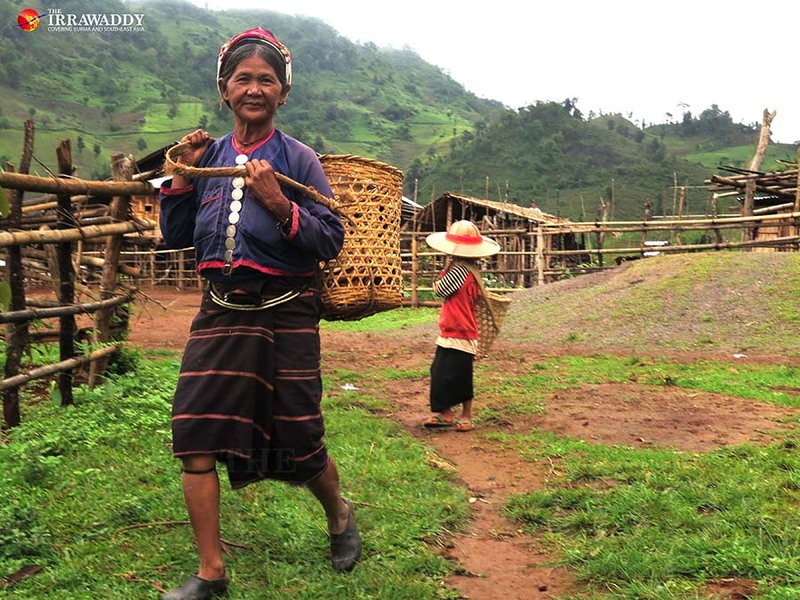 She grows corn and rice on a hillside farm in the middle of Lwel Soh village. In cold season, she grows poppy. Her two daughters help her on the farm but her husband spends most of the days at home, sleeping and doing drugs, she said. Growing corn and rice is not an easy job. It takes weeding, plowing and plenty of elbow grease. Shan and Chinese businessmen come to the villages to buy opium latex in the later period of cold season. One viss [around 1.6 kg] of opium latex is sold for 300,000 kyats. Palaung women in Mongyaw only earn a maximum 700,000 kyats a year from selling opium latex, locals said. “Men only do drugs here. They don’t work. And there are fights when some women refuse to give money to their husbands. 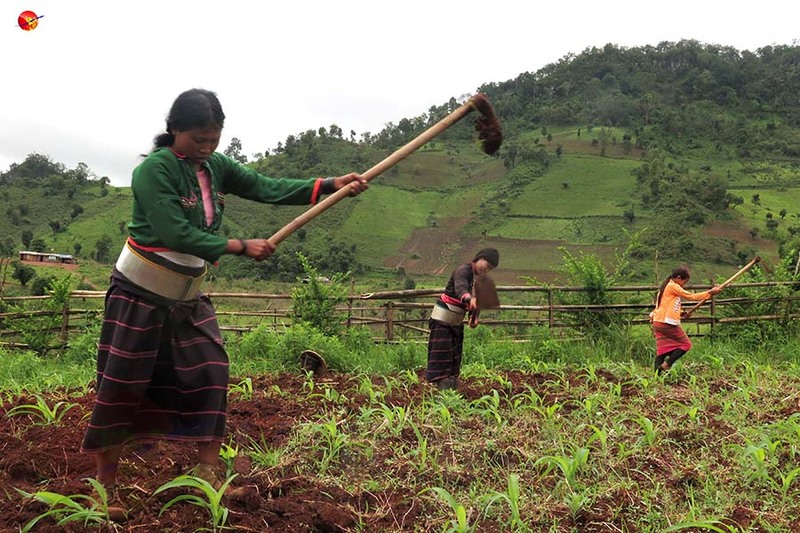 Men beat their wives and many have divorces,” said Lwei Aye Naung of Pansai village. Many women in the villages give birth to between six and 10 children, who have to begin helping their mothers on the farms when they are about nine of 10 years olds. Some Palaung parents sell their children because they cannot afford to raise them. They go to Lashio and sell them to Shan and Chinese businessmen for 200,000 to 400,000 kyats for a child, locals said. Girls who remain at home have to share household chores with their mothers, babysitting their younger siblings, tending to cattle and helping on farms. What is worse is that the custom of arranged marriage is still maintained in Mongyaw. The fiancé’s family gives a dowry, but once engaged, the fiancée has to help her future mother-in-law with her household chores. Usually, Palaung women are engaged as teenagers. Palaung girls say they feel like they are being bought. Divorce procedures are also not fair for Palaung women. They are forced to return their dowries if they choose not to marry their fiancés after the engagement or if they get divorced after having children. “Men don’t have to pay anything to ask for a divorce,” said Mar Aye Saung of Lone Tet village. After divorce, most women care for the children. “It is unlucky to be a woman here. In a marriage, both man and woman should work together,” said Mar Aye Saung. According to the Ta’ang Women’s Organization (TWO), some men from Mongyaw go to China and the Thai border to work. But most of them do not come back and abandon their families. A decade ago, men in Monyaw were dutiful breadwinners, but these days, men only care for doing drugs, said Lwe Poe Ka Mi Khe, a research officer of the TWO. Some men have moved to other areas because of recruitment by armed groups, she said. “Men don’t stay home as a result of fighting. And drugs are easily available and men use them. So, women had to take a lead role in earning livelihoods. As time went by, it became a custom,” she said. Against all of the outward appearances of shinning silver and brightly dyed clothing, Palaung women lead a hard life in Mongyaw. Mongyaw is not under the administrative influence of the government, but is an area under the control of the Man Pan people’s militia. The Shan State Army-North and Ta’ang National Liberation Army are also active in the area.